Bake an eight inch two-layer cake. Ice it in white buttercream icing. 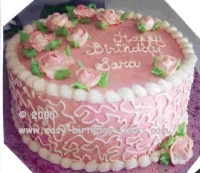 Use white icing and round tip, size #5 to do lace work on the sides of the cake. The lace work is done by making squggly lines over the surface you are covering. 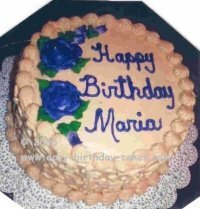 With star tip, size #18 and white icing, make the shell border on the top and bottom edge of the sides of the cake. 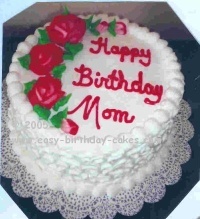 With round tip, size #5 and the color icing of your choice, write your message on the top of the cake. With the same color icing as your message, make roses and place them around the message. The leaves are made with green icing and leaf tip, size #352. Check out these Birthday Candy Wrappers that can be personalized with your message. They make wonderful party favors for your guests.